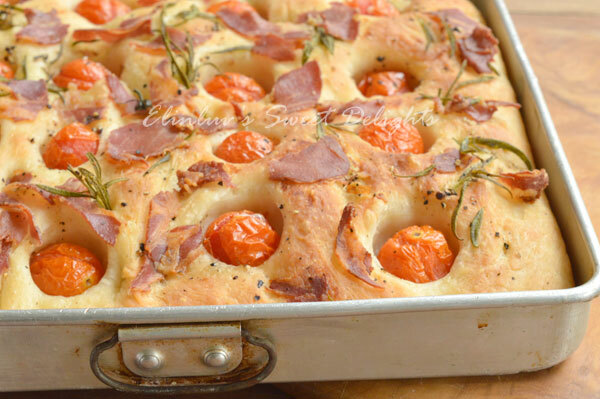 I goggled for a good focaccia dough recipe and I found Jamie Oliver's Three flavor Focaccia dough recipe a good one. Easy to make and within half an hour, I got the dough ready for proving. 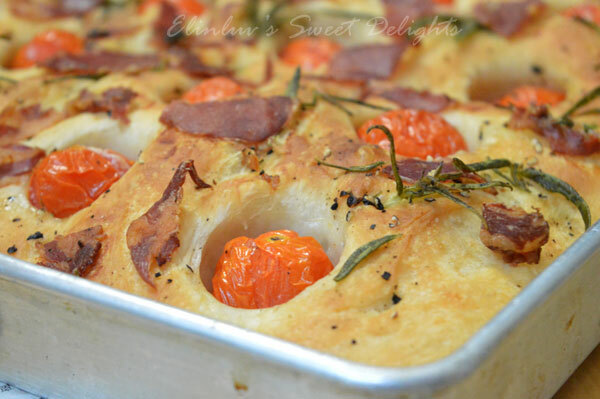 I tweaked it and used three types of flour to make the dough. Instead of following Jamie's flour ratio, I used 2 cups of bread flour (high protein flour ), 1 cup of cake flour (low protein flour) and 1 cup of multi purpose flour. And guess what ! the dough turned out so good that I would like to share with you. 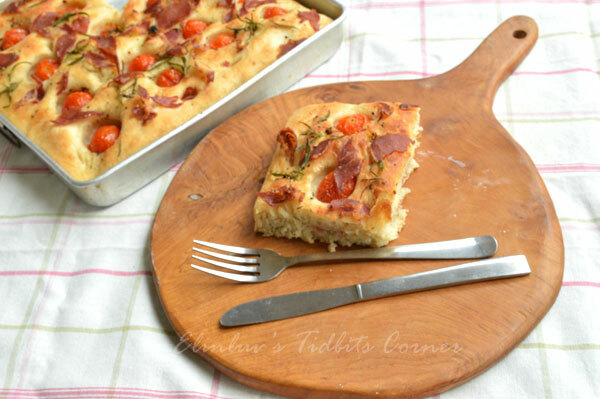 The good thing about focaccia is , it is versatile, you can add anything you want to make it more tasty. I added salami , cherry tomatoes for texture and rosemary, rice bran oil and black pepper for flavor. 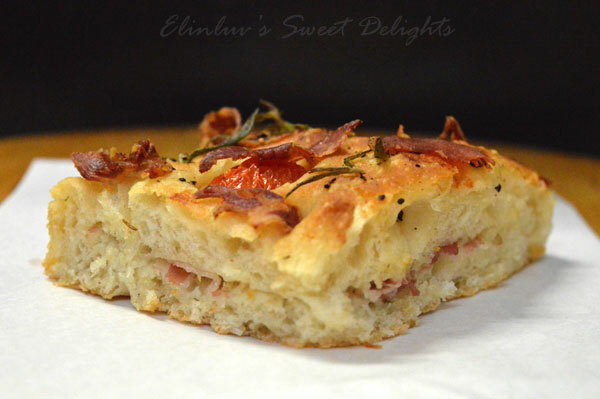 Awesomely delicious ! it won't pop out during proving. on the top and the moist one in the center...yummz! Wild Boar and I had this for afternoon tea......simple and yet delicious. Place the flours and ½ tablespoon of sea salt into a large bowl, and make a well in the middle. Add the yeast and sugar to the lukewarm water, and mix with a fork. 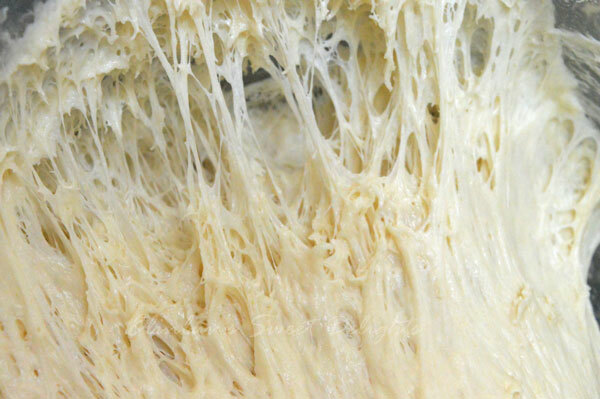 Leave this for a few minutes and, when it starts to foam, slowly pour it into the well, mixing with a fork as you go. 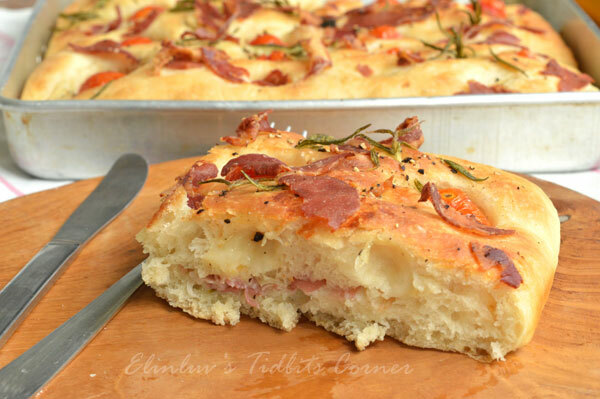 As soon as all the ingredients come together, which may take a minute or so, knead vigorously for around 5 minutes until you have a smooth, springy, soft dough. Lightly oil a large bowl with some olive oil and transfer the dough to the bowl. Dust with a little extra flour, cover with a tea towel and leave to prove in a warm place for 30 minutes until doubled in size. 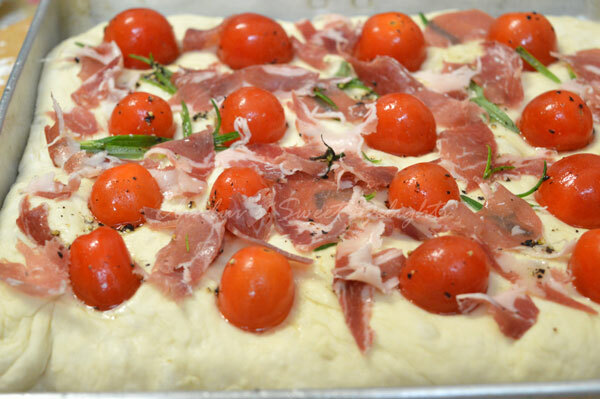 While the dough is rising, preheat your oven to 220°C/425°F/gas mark 7 and prepare the toppings. Marinate the tomatoes with the rosemary infused oil. 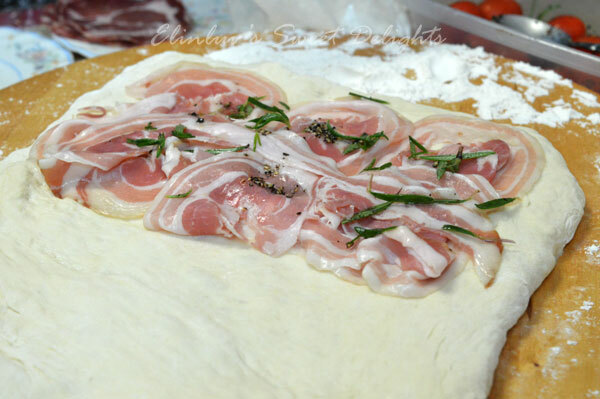 Once the dough has risen, punch down the risen dough, using the hand , shape the dough on a floured surface into a rectangular shape, place the slices of pancetta on the top 1/2 part of the rectangular, drizzle a tsp of the infused oil together with rosemary over the surface of the pancetta. 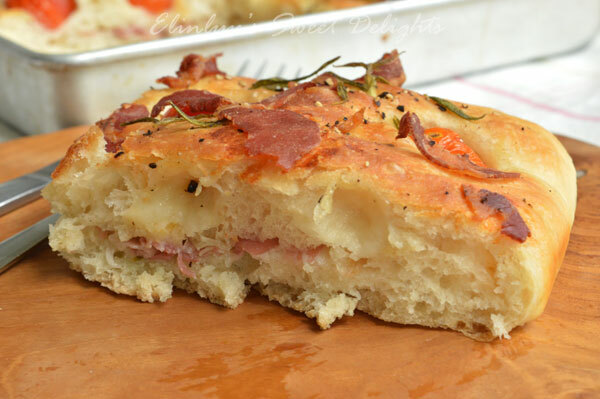 Fold the bottom part of the dough over the salami top. Then place the now square dough on a greased baking tray and gently spread it out to cover the tray. 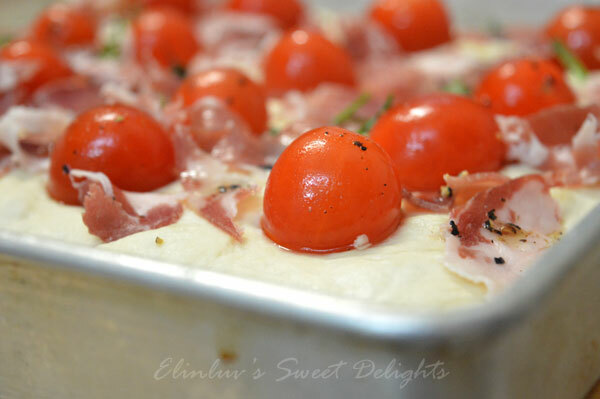 push the cherry tomato half way down the dough so that it won't pop out during proving. 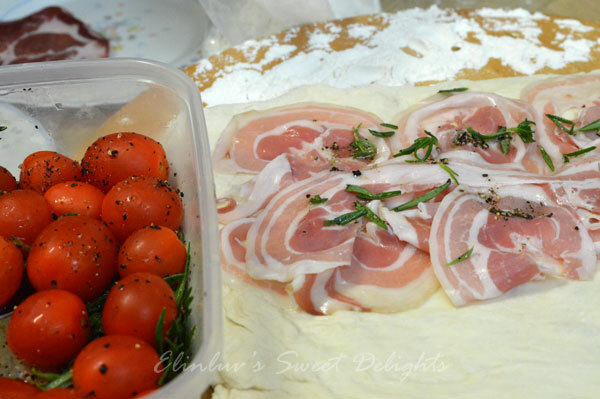 Spread out pancetta shreds all over the surface and drizzles the rosemary infused oil evenly on the surface , make deep dimples with the fingers all over the surface and leave it to prove for a further 20 mins. Baked at 220 deg C for 20-25 mins till golden brown or cooked.